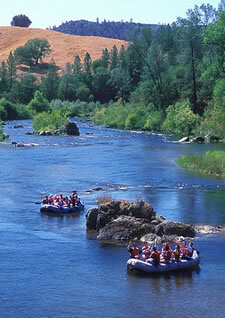 Raft on the very river that sparked California's famous Gold Rush! The American River literally flows right through the world-famous town of Coloma, where James Marshall's lucky discovery in 1848 led to "the world rushing in." Less than an hour from Sacramento, and near the historic towns of Auburn and Placerville, Coloma offers family-friendly whitewater rafting, historic buildings, and local wineries. For more excitement, try the Class III section of the South Fork of the American with its classic whitewater and views of the Coloma Valley. We offer Express, 1- and 2-Day trips perfect for reunions, corporate events and Bachelor / Bachelorette Parties. Nearby, the Middle Fork of the American offers Class III-IV whitewater guaranteed to thrill the adventurous first-time rafter and experienced boater alike. This beautiful, steep canyon is home to our most popular 2-Day trip. If you want intense springtime action and challenging Class IV rapids, consider the North Fork of the American. This river typically runs late April through May.